This Grilled Skirt Steak Fajitas recipe is easy enough to make at home and tastes like those you get at your favorite Mexican restaurant. It's the perfect family dinner and is quick to mix up on a busy night. Just don't forget to give yourself a couple hours for the marinade. 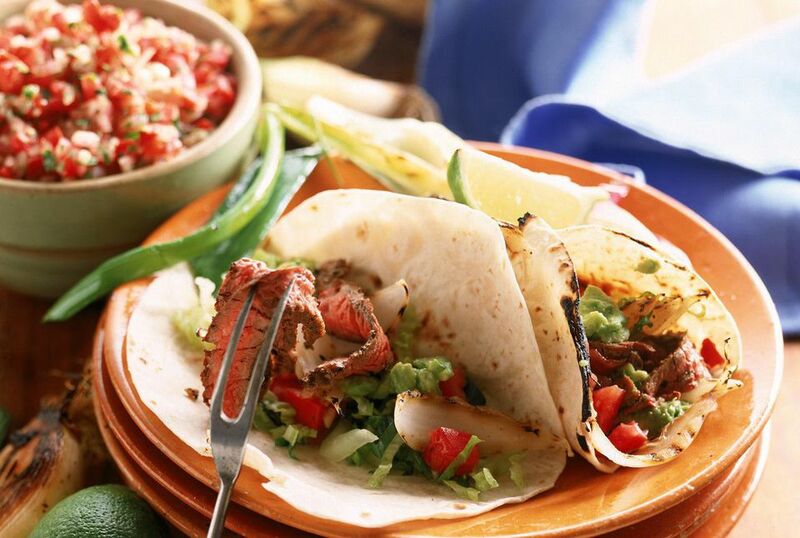 Fajitas are actually a Tex-Mex specialty. The Spanish word “fajita” means “little strips” and comes from the word “faja,” which means “belt,” “strip,” or “girdle,” It refers to the strips of meat (usually skirt steak) originally used for this dish. This recipe works just as well with chicken, pork, or vegetables if you do not want to use beef. This recipe will feed up to six people with two fajitas a piece. In a large, heavy-duty freezer bag, combine garlic paste, lime juice, cumin, and olive oil. Seal and shake to combine. Place skirt steak, bell peppers, onion, and cilantro sprigs into the bag, squeeze out the air, and turn to coat the meat, distributing vegetables evenly. Refrigerate at least 2 hours or overnight to allow marinade to penetrate. If you do not have a gas or charcoal grill, you may use a cast iron or heavy grill pan on the stovetop. It is important that the pan is very hot before searing the meat so it is done quickly. An overhead exhaust fan is mandatory for indoor stovetop grilling. Heat the gas or charcoal grill to high heat. While the grill is heating, remove skirt steak from the marinade and place on a platter, shaking off the liquid and reserving marinade with the vegetables. Heat a heavy skillet to the smoking point. Drain vegetables and cilantro, and quickly stir-fry over high heat until slightly charred and softened, but not mushy. Set aside and keep warm. Grill the skirt steak over high heat until medium-rare -- about 2 minutes per side. Slice meat into strips against the grain and serve immediately with warm tortillas, the seared vegetables, and the toppings of your choice. To eat Mexican fajitas, diners traditionally place strips of meat with grilled vegetables, guacamole, salsa, and sour cream into the tortilla, and fold it up taco- or burrito-style. You can even place all the ingredients on the table and allow everyone to build their own as they please.